Jan Scruggs, “Jan Scruggs,” Histories of the National Mall, accessed April 23, 2019, http://mallhistory.org/items/show/69. 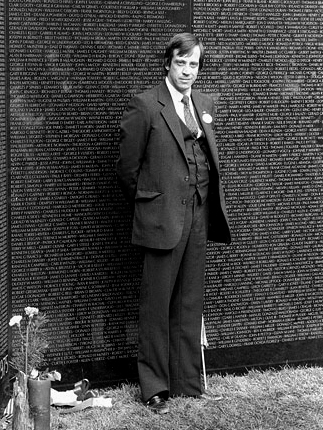 Decorated Vietnam veteran Jan Scruggs is the founder of the Vietnam Veterans Memorial in Washington, DC. He conceived the memorial as a tribute to all who served during one of the longest wars in American history. He started the project with $2,800 of his own money and collected nearly $8 million in private donations to fund the construction of the memorial. Scruggs currently serves as the President of the Vietnam Veterans Memorial Fund. Dane A. Penland (Smithsonian Institution) via Wikimedia Commons. View original. Jan Scruggs was born the youngest of four children in Bowie, Maryland. Upon graduation from high school he enlisted in the army and served two years in Vietnam as part of the U.S. Army’s 199th Light Infantry Brigade. In 1969, wounded by shrapnel from a rocket-propelled grenade, he returned to the United States. He enrolled at American University, completing both a bachelor's and a master's degree. During this period, he grew interested in the experiences of the war veterans. After completing his degrees, he went to work for the US Department of Labor. In 1979, he began working to create a memorial for the veterans of the Vietnam War. With a group of veterans, Scruggs founded the Vietnam Veterans Memorial Fund (VVMF), a nonprofit organization dedicated to the creation of a national memorial for those who served during the Vietnam War. Over the next three years, Scruggs and his supporters raised the funds to support the construction of the memorial, worked to receive congressional approval, and dealt with critics of the memorial's design. Known as "the wall," the memorial was dedicated in 1982. In 1985, the VVMF disbanded and Scruggs enrolled at the University of Maryland, Baltimore, where he earned a law degree. In 1988, NBC aired a movie of the week titled “To Heal a Nation,” based on his efforts to build the Vietnam Memorial. In 1992, the VVMF formed again with Scruggs as President. The organization provides charitable support to children in Vietnam and aims to expand the Vietnam Memorial to include an education center, which will highlight the objects left at the wall.